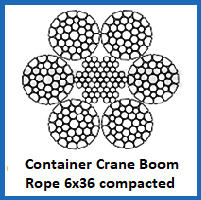 Snap up high quality container crane boom rope 6×36 compacted construction wire rope for the boom of a container crane from Rope Services Direct and experience the benefits it offers. The diameter and length can be altered as you see fit as part of our entirely bespoke service. This wire rope will reel in containers, handle them steadily and complete regular, intensive lifting cycles without succumbing to fatigue or corrosion. The 6×36 construction can be chosen with either a steel core or a fibre core, and this is not the only variable across the range. 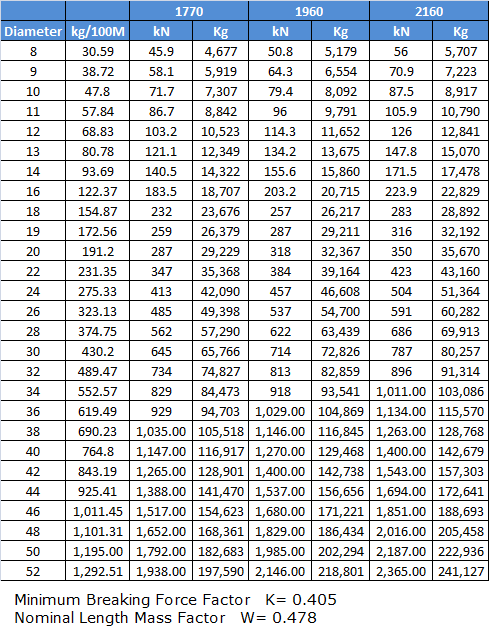 There are also lots of different diameters and breaking loads to consider. Between 30mm and 62mm of thickness is on offer, along with 817kN and 3198kN of strength provided. This type of wire rope is not rotation resistant, which is why it is a good option for use on the boom assembly of a container crane. Our range of overhead crane rope does come with non-rotation wire configurations. 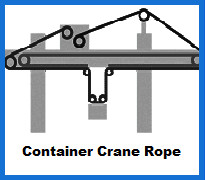 The same is true of our ship crane rope, with 24×7 construction and 35×7 construction products available. Crane rope can be a complex topic to master, so let our experts help you sift through our various products and find the best rope for the job. Contact us online and we will send you an email reply. Call 01384 78004 if you would prefer a real time chat. Container Crane Boom Rope 6x36 Compacted Construction Overall rating: 5 out of 5 based on 6 reviews.